With Restoration Manager you have a double guarantee. Take a look at the trial version for free and no obligation. If you like it and think it will help you with your restoration, buy a serial number for the full version and unlock the trial. If in the first 90 days it's not working for you ask for a full refund with no quibble (although it would be good to know how we can improve Restoration Manager). You can unlock your trial version of Restoration Manager for just £30 and you can be up running with the full version in just a few minutes. 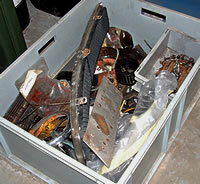 With your unlocked Restoration Manager and a little bit of effort when stripping down your vehicle you'll be able to locate and identify all of your restoration parts that usually end up in a box like the one on the left. Don't forget the Not Working For me guarantee; if you buy Restoration Manager and find it's not helping your restoration project in the first 90 days, will refund your money without any quibble. After paying via the secure PayPal service, you will be emailed your unique serial number, which you can use to unlock your trial version of Restoration Manager. There's no more installing to do and any information you have already entered into Restoration Manager will be kept. To unlock your Restoration Manager Trial version simply click on the PayPal logo or link below.